When you’re running a business, you’re going to want your employees to be delivering results day in day out. So when workers suffer from a dip in productivity, it’s going to set the whole company back. However, there are steps that you can take to prevent this. From the seats that they sit on to where they work, there are a number of ways you can make your employees’ working day a lot more pleasant – and when you have happy workers you will be a lot happier with the results they deliver! For many workers these days, flexibility is a necessity. So allowing your employees to work remotely is a great way to get around that. Working from a personal or company device ensures that they will be able to deliver results at optimum capacity rather than a stressed or rushed effort in reduced office hours. Comfortable seating is a must for any desk worker. Often, office chairs just come in a ‘standard’ size or shape so for workers who are bigger or smaller in their build, this isn’t going to be very comfortable. Therefore tailored seating is perfect for those who need a little more support. If you invest in your employee’s comfort, you’ll reap the rewards. A bright, welcoming office space is essential if you want your workers to feel comfortable while at work. Keep the windows uncovered at the office and the room well lit when it’s dark – nothing hampers productivity more than not being able to see what you are seeing, after all! Bright, airy colours on the walls will stop the work space feeling too oppressive and if you have the room, some plants or pictures lend the space that homely touch. Repetitive strain injury is the bane of many an employer’s life, so prevent it by investing in some wrist supports for your workforce. Being able to type comfortably will mean that your employees are able to work at speed and for much longer too, with no risk to their own health. Padded mouse mats are a good addition to a workstation too. A separate social area will mean that your employees work when they are at their desk and play when they are away from it! Nothing will distract employees more than their fellow workers taking personal calls or eating at their desks – so establish a separate area where they can take their breaks without disturbing others. When they are at their desks however, it’s a time for work and nothing else. 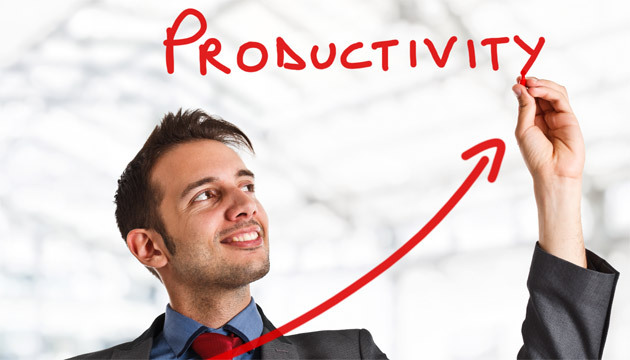 Hopefully the above advice will help you figure how to improve productivity within your team. Being open to suggestions and criticism will help too, as your employees may already have issues that they want to discuss with you. With a combination of good communication and wise purchases, your workforce will go from zeroes to heroes in no time at all! As long as they are comfortable and happy when they are in the office, the results that you are after will look after themselves. Patrick Boland is the CEO of the quality and comfortable heavy-duty office seating company – H&M Ergo Seating. Patrick believes that by ensuring your employee’s are comfortable and happy in the office environment, will increase productivity and staff morale.